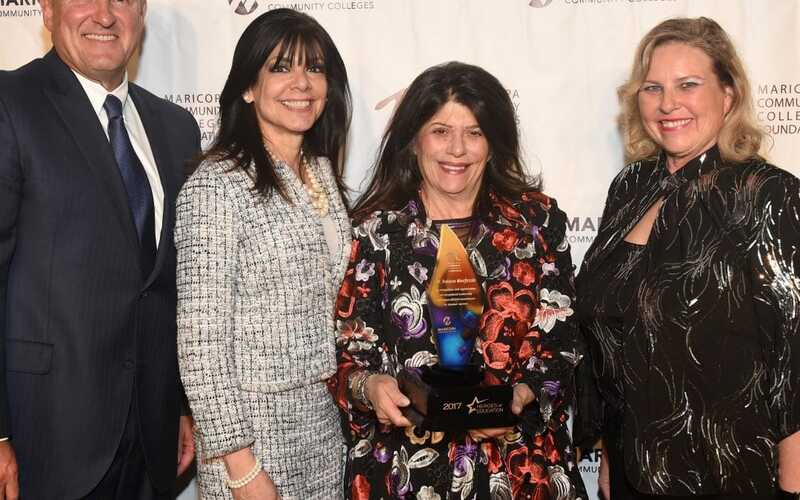 Each year, the Maricopa Community College Foundation (MCCF) selects a Hero of Education among the community and business leaders who have contributed to Arizona public education, MCCCD, and our students. Ioanna Morfessis, Ph.D., was selected as the 2017 Hero of Education. She is the president of IO.INC., and is regarded as one of the nation’s top economic development visionaries, known for her ability to create and execute growth strategies, and forge enduring and effective private-public alliances between business, government, and education. Dr. Morfessis is a strong supporter of mentoring and scholarships. This year, MCCF invited Foundation Scholarship recipients to attend the April 26 Heroes of Education dinner at the Sheraton Phoenix Downtown Hotel. The students were seated at each table with donors and other guests. This offered scholarship supporters the opportunity to know how their donations impact lives by hearing a recipient’s story personally. Heroes of Education is also a fundraising event, raising more than $1.5 million in scholarship funds for Maricopa Community College students from 2006 to 2016. To fund future scholarships, guests were able to contribute during the evening and bid on items during a live auction. The evening began with a welcome and introduction from Russ Johnson, chair of the MCCF board of directors, and Christina Schultz, president and CEO of MCCF.